The Bloch sphere is a nice visualization of single qubit states. Mathematically, it can be generalized to any number of qubits by means of a high-dimensional hypersphere. But such things are not easy to visualize. What attempts have been made to extend visualizations based on the Bloch sphere to two qubits? 1) A real value w between 0 and 1 indicating the weight of not-entangled vs fully-entangled. 2+3) The not-entangled unit bloch vector for qubit 1. 4+5) The not-entangled unit bloch vector for qubit 2. But note that a) this 'envelope' representation is not symmetric (one of the qubits is the control and the other is the target) and b) although it looks pretty it's not algebraically compact. This display is available in the alternate dev-entanglement-display branch of Quirk. If you're able to follow the build instructions, then you can play with it directly. Since a spin $j$ irreducible representation of $SU(2)$ has a dimension $2j+1$ ($j$ is half integer), any finite dimensional Hilbert space can be obtained as a representation space of $SU(2)$. Moreover, since all irreducible representations of $SU(2)$ are symmetric tensor products of the fundamental spinor representation, therefore every finite dimensional Hilbert space can be thought of as a symmetric tensor product of fundamental $SU(2)$ fundamental representation spaces. This is the basis of the Majorana stellar representation construction. A state of a qudit living in a Hilbert space of dimension $2j+1$ can be represented by $2j$ points on the Bloch sphere. The state vector can be reconstructed from the $2j$ (2-dimensional) spin vectors of the $2j$ points by a symmetrized tensor product. One application of this representation to quantum computation, is in the visualization of the trajectories giving rise to geometric phases, which serve as the gates in holonomic quantum computation. These trajectories are reflected as trajectories of the Majorana stars on the Bloch spheres and the geometric phases can be computed from the solid angles enclosed by these trajectories. Please see Liu and Fu's work on Abelian geometric phases. A treatment of some non-Abelian cases is given by Liu Roy and Stone. Finally, let me remark that there are many geometric representations relevant to quantum computation, but they are multidimensional and may be not useful in general as visualization tools. Please see for example Bernatska and Holod treating coadjoint orbits which can serve as phase spaces of the finite dimensional Hilbert spaces used in quantum computation. The Grassmannian which parametrizes the ground state manifold of adiabatic quantum Hamiltonians is a particular example of these spaces. In another article, the two qubit representation is described as a seven-dimensional sphere, S 7, which also allows for a Hopf fibration, with S 3 fibres and a S 4 base. The most striking result is that suitably oriented S 7 Hopf fibrations are entanglement sensitive. Having said that, a Bloch sphere based approach is quite useful even to model the behavior of qubits in a noisy environment. There has been analysis of the two-qubit system by use of the generalized Bloch vector to generate tractable analytic equations for the dynamics of the four-level Bloch vectors. This is based on the application of geometrical concepts from the well-known two-level Bloch sphere. There is another interesting research article on the representation of the two-qubit pure state parameterized by three unit 2-spheres and a phase factor.For separable states, two of the three unit spheres are the Bloch spheres of each qubit with coordinates (A,A) and (B,B). The third sphere parameterises the degree and phase of concurrence, an entanglement measure. This sphere may be considered a ‘variable’ complex imaginary unit t where the stereographic projection maps the qubit-A Bloch sphere to a complex plane with this variable imaginary unit. This Bloch sphere model gives a consistent description of the two-qubit pure states for both separable and entangled states. As per this hypothesis, the third sphere (entanglement sphere) parameterizes the nonlocal properties, entanglement and a nonlocal relative phase, while the local relative phases are parameterized by the azimuthal angles, A and B, of the two quasi-Bloch spheres. We have some multiqubit visualizations within Q-CTRL's Black Opal package. 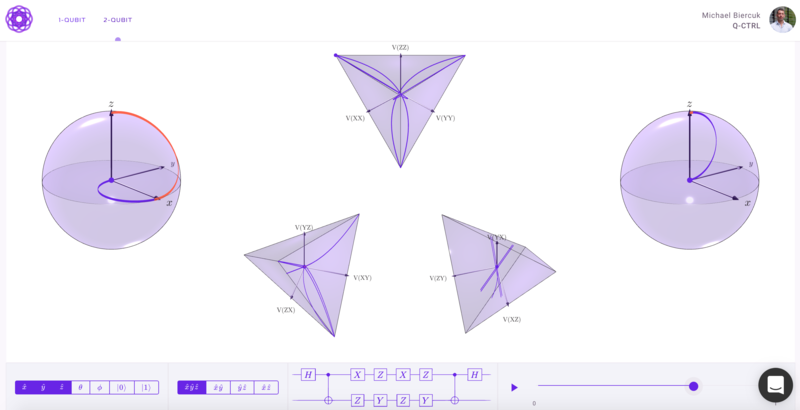 These are all fully interactive and are designed to help build intuition about correlations in interacting two-qubit systems. The two Bloch spheres represent the relevant separable states of two qubits. The tetrahedra in the middle visually capture correlations between certain projections of the two qubits. When there is no entanglement, the Bloch vectors live entirely on the surfaces of the respective spheres. However, a fully entangled state lives exclusively in the space of correlations in this representation. The extrema of these spaces will always be maximally entangled states like Bell states, but maximally entangled states can also reside within multiple tetrahedra simultaneously. A paper has been published on the subject, called "Bloch sphere model for two-qubit pure states"
Not the answer you're looking for? Browse other questions tagged resource-request bloch-sphere or ask your own question.